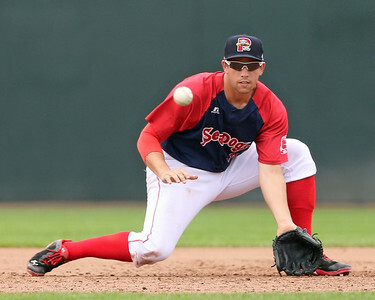 Weber also caught up with Garin Cecchini (pictured) who spent the off-season working hard on fielding. Cecchini also discussed studying the approach of players like Mike Napoli. If you were wondering when you will be able to catch this year's spring training games, Peter Abraham of the Boston Globe shares the 2014 schedule. There will be 18 televised games and an additional 16 broadcast on WEEI. Abraham also touches base with Steven Wright, who is sidelined after having surgery in the off-season for a sports hernia. WEEI's Alex Speier reports on a few key Red Sox prospects, including Sean Coyle, who has been getting in some work at third base. One of the main focuses in camp, Xander Bogaerts (pictured) talks with WEEI's Mike Petraglia about trying to ignore the talk about Stephen Drew and trying to act like a seasoned veteran both on and off the field. The Boston Herald's Steve Buckley has a great article on how Bogaerts preparing himself for full-time life in the major leagues. Buckley also touched base with Jackie Bradley Jr., who feels like the bright lights and attention are not as intense as they were last spring training. Speier also touched base with two of the Red Sox most intriguing pitching prospects, Rubby De La Rosa and Allen Webster. De La Rosa indicates feeling incredibly better from where he was last season, coming into camp down about 10 pounds. Webster talks about his time in the Dominican this off-season as well as needing to stay ahead in the count to be effective. The Providence Journal's Tim Britton shares an early pitching schedule with us for the Red Sox first four minor league contests. Jonathan Herrera talks with MassLive.com's Jason Mastrodonato about his willingness to play anywhere and his reaction to being traded this winter.